Above, the first two of the 20 observations that New Horizons made of 1994 JR1 in April 2016. The Kuiper Belt object is the bright moving dot indicated by the arrow. The dots that do not move are background stars. The moving features in the top left and far right are internal camera reflections (a kind of selfie) caused by illumination by a very bright star just outside of LORRI's field of view; the one on the left shows the three arms that hold up LORRI's secondary mirror. Warming up for a possible extended mission as it speeds through deep space, NASA's New Horizons spacecraft has now twice observed 1994 JR1, a 90-mile (145-kilometer) wide Kuiper Belt object (KBO) orbiting more than 3 billion miles (5 billion kilometers) from the sun. Science team members have used these observations to reveal new facts about this distant remnant of the early solar system. Taken with the spacecraft's Long Range Reconnaissance Imager (LORRI) on April 7-8 from a distance of about 69 million miles (111 million kilometers), the images shatter New Horizons' own record for the closest-ever views of this KBO in November 2015, when New Horizons detected JR1 from 170 million miles (280 million kilometers) away. Simon Porter, a New Horizons science team member from Southwest Research Institute (SwRI) in Boulder, Colorado, said the observations contain several valuable findings. "Combining the November 2015 and April 2016 observations allows us to pinpoint the location of JR1 to within 1,000 kilometers (about 600 miles), far better than any small KBO," he said, adding that the more accurate orbit also allows the science team to dispel a theory, suggested several years ago, that JR1 is a quasi-satellite of Pluto. 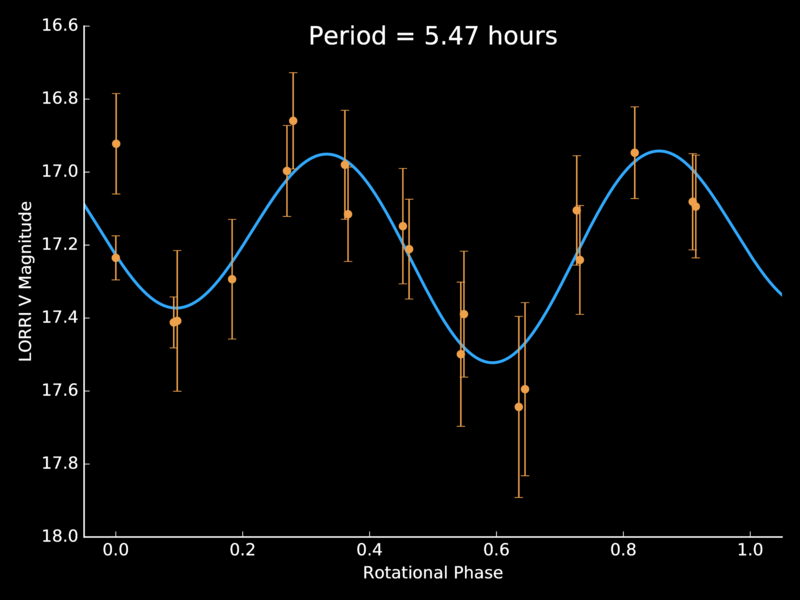 New Horizons scientists used light curve data – the variations in the brightness of light reflected from the object's surface – to determine 1994 JR1's rotation period of 5.4 hours. 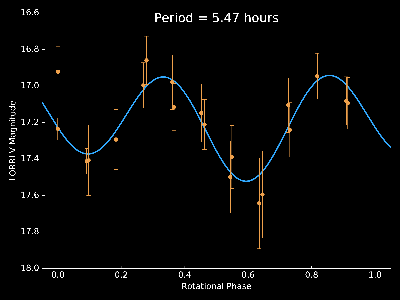 From the closer vantage point of the April 2016 observations, the team also determined the object's rotation period, observing the changes in light reflected from its surface to determine that a JR1 "day" is 5.4 hours. "That's relatively fast for a KBO," said science team member John Spencer, also from SwRI. "This is all part of the excitement of exploring new places and seeing things never seen before."